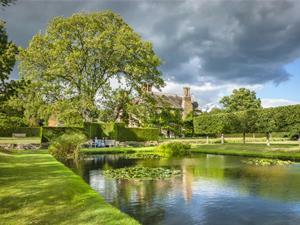 The lily pond at Bateman's, East Sussex. There is disabled access to the ground floor of the house only. A virtual tour is available of the upstairs and also the watermill which has no disabled access. Bus: hourly service from Uckfield to Etchingham (weekdays) - less frequent at weekends.